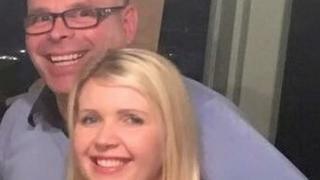 The death of an engineer killed by an ammonia leak at a brewery was accidental, an inquest has concluded. David Chandler, from Bridgnorth, Shropshire, died at the Carlsberg plant in Northampton on 9 November 2016. Northampton Coroner's Court heard the 45-year-old died from inhalation of ammonia having been exposed to a "sudden release" of gas. The jury concluded the leak from a valve on a compressor was "preventable". Last week, Jamie Davies from the Health and Safety Executive told the inquest he found an isolation valve in the pipework had not been closed at the time of the leak. A project engineering manager at the brewery at the time said Carlsberg had not carried out a risk assessment on the isolation of the gas. Mr Chandler had been employed as a subcontractor to remove a dormant compressor unit. His colleague Stuart Wright said "grey and white smoke" had burst out of a valve in pipework surrounding the compressor following a "massive explosion". The jury heard the father-of-two would have become "rapidly unconscious". Coroner Philip Barlow said the risk assessment, method statement and permit-to-work system for sub-contractors were not "accurate or at least sufficiently detailed to provide a safe system". Mr Barlow told the court Carlsberg now have a system in place to improve safety. Following the inquest, Mr Chandler's wife Laura said: "Listening to the details of how and why David died has been devastating beyond belief. "During the course of the inquest it became abundantly clear that there were numerous opportunities to prevent the incident which robbed me of my husband and Ava and Isabella of their daddy." A spokesman for Carlsberg said: "The tragic events of 9 November 2016 left a deep mark on many people, but we recognise that nothing compares with the permanent impact on the family and friends of David Chandler, who were affected so tragically. "The well-being of everyone who works in and around our business is always uppermost in our minds, and we will continue to take all necessary steps to ensure their safety. "